The Week in HD - Monday 25th March | What Hi-Fi? Hello everyone, and welcome to The Week in HD - our guide to all the must-see TV shows, films, sports and Blu-ray releases to grace your screens over the next seven days. The biggest news of the week? Doctor Who is back! That's right, the second half of series 7 is back just in time for Easter. Our Saturdays are full of timey-wimey joy and adventure again, and I'll be able to stop twirling my sonic screwdriver in anticipation. Elsewhere, we've got some strong British dramas in the shape of ITV's Broadchurch and BBC's The Village, while World Cup 2014 qualifiers are keeping sports fans glued to the screens. 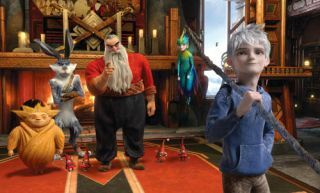 DreamWorks Animation brings us this festive melting pot of 'guardians' – Santa Claus, the Tooth Fairy, the Easter Bunny and the Sandman – trying to stop the boogeyman Pitch Black from spreading darkness across children and then the world. A new guardian, Jack Frost, is enlisted to help them – but can this immature icy boy that no child believes in really help to save the world? Thanks to some wonderful animation coupled with the voice talents of Chris Pine, Hugh Jackman, Jude Law, Isla Fisher and Alec Baldwin, it's a good family film for the Easter break. Flat Bread. From tortillas to pittas, Hollywood takes us through all the different types of flat bread from around the world, cooking up some delicious recipes along the way. I'm hungry already. This crime drama series has been hotly anticipated thanks to the pedigree of British actors on the cast, including David Tennant, Olivia Colman, Arthur Darvill, Vicky McClure and David Bradley. When young Danny Latimer is found murdered on the beach, a sleepy Dorset town is thrown into a chaos of long-held secrets and an oncoming media storm. A Giant Gun, Filled With Drugs. The title is a bit of a giveaway, but this episode sees the introduction of Rhys, Holmes's former drug dealer (played by the always-watchable John Hannah), who needs Holmes's help in recovering his abducted daughter. Filmed over two nights at stadium gigs in Fresno, California, the legendary US hard rockers play their best tunes and more to a live 1992 audience. Even if you're a David Lee Roth fan, this is still well worth a watch – especially for Michael Anthony's teeth-grittingly manic bass solo and the sight of Eddie playing his guitar with an electric drill. Another round of amateurs tackle the invention test, and have their palate assessed with a deceptively simple dish of pappardelle (flat pasta) with meatballs and tomato sauce. An odd but interesting pairing: Iron Man director Jon Favreau and pro-skateboarding legend Tony Hawk team up to talk life, ambition, fear and failure while touring Stan Winston's special effects studio and the world's biggest permanent skate ramp. Another helping of hopeful chefs attempt to impress with their cookery skills through the invention test and the palate exam, which today includes venison and beetroot. When James May isn't being Captain Slow on Top Gear, he's off re-discovering and re-inventing skills and tasks that are manly in nature. In the season three premiere, May prepares to commentate live on the Grand National with the help of a memory champion. This 2007 Coen Brothers thriller sees Josh Brolin stalked by a menacing Javier Bardem, who's hell-bent on retrieving $2million from Brolin after a drug-deal gone wrong. Violence and mayhem ensues. Also stars Tommy Lee Jones, Woody Harrelson and Kelly Macdonald. Los Moscos. The second (and final) series opens with Brother Justin seeking out the elusive Henry Scudder with less-than-chartiable intentions, while the shadowy Management urge Ben to find his father. A new six-part drama written by Peter Moffat charts the life and times of a small English village across the entirety of the 20th century, with the life of Bert Middleton providing the backbone to the story. Starting in Derbyshire in 1914, where Bert lives with his family on a farm, his life will never be the same again as beautiful Martha Lane emerges from the first bus to stop by the village. Stars John Simm, Maxine Peake, Charlie Murphy, Joe Armstrong and Bill Jones.